The NEO typology is a consumer classification, revealing that society is split pretty much in two: the Next Economic Order or NEOs, and the traditional economic order or Traditionals. And they’re as different as truffles and McDonald’s. The first type is the socially progressive, high-spending, high discretionary-choice NEOs, 93 per cent of whom are in the Big Spender category (the top third of discretionary spenders in the economy). Their traditional cousins have decidedly conservative social attitudes, are reluctant spenders and passive investors; and exhibit low discretionary-choice behaviour. Regardless of their income or net worth, Traditionals are price-sensitive and more interested in features, functions, status and the right deal than they are in quality and a premium relationship. As a consequence, only 4 per cent are in the top third of discretionary spenders. NEOs are far from some small niche in society — they are a quarter of the population, and have powerful social and business clout. They will buy new technology — all those 4G smartphones, tablets, WiFi devices, wearables and implantables — but they’ll also spend their hard-won rewards on home extensions and renovations, travel, eating in and out, drinking, online banking, investing in shares and online high-interest savings accounts, and an entire range of services that make their lives easier, more individual, and more controllable. They vote governments in and out, fill our colleges and universities, and take professional roles and executive positions. There are 4.6 million NEOs in Australia and 60 million in the USA. A NEO is born a NEO and, depending on circumstances throughout his or her life, will always be either a NEO (24 per cent of population) or an Aspiring-NEO (26 per cent). A Traditional is born a Traditional and will die a Traditional (50 per cent). There is no migration between one half of the population and the other. According to Immanuel Wallerstein all stable systems disrupt, and become unable to continue their regular, slow upward trajectory. Having reached a kind of stable equilibrium during the post-war boom, by the late 1980s the consumer economy was becoming increasingly unstable and chaotic. The result? What Wallerstein would call inevitable bifurcation. The world economic order bifurcated, split in two, creating the New Economic Order (NEOs) and the Traditional Economic Order (Traditionals). This chaotic bifurcation correlated with the failure of communism in 1989, the replacement of the industrial age by the digital age in 1991, the global recession that swept the globe between 1989 and 1993, and the overthrow in 1991 of post-modernity by neo-modernity. NEOs are largely metropolitan dwellers, with more of them living in urbanised NEO cities like Melbourne, Sydney, Vancouver (Canada), San Francisco (California) than anywhere else. Fifty-three per cent of NEOs are women and 47 per cent are men; and while NEOs range over all age groups, they tend to be younger than Traditionals. NEOs exceed the national average in every age profile between age 20 and age 50, while Traditionals exceed the national average in every profile above age 50. That said, there are plenty of NEOs in their sixties. More than half (53 per cent) of NEOs have a university degree, compared to 30 per cent of the population or 17 per cent of Traditionals. NEOs are as committed to learning a living as they are to earning a living. Because NEOs are most likely to be in professional or management occupations, or to have started their own business, they earn more than the rest of society. Specifically, they dominate every income category above $50,000 pa, and are five times more likely than Traditionals to earn in excess of $100,000 pa. But they earn more because they are NEOs; they are not NEOs because they earn more – how much someone earns does not automatically determine how much they spend. And NEOs spend more … and more frequently … than anyone else – typically, 3 times what Traditionals spend. NEOs are also significantly over-represented in the top two deciles of Australia’s net wealth. A third (31.3%) of them are in the top two deciles, compared to only 15% of Traditional Australians. The top decile of net wealth is valued at $4.04 trillion – half of all net wealth in Australia. One in five NEOs (19%) are in the top decile, compared to only one in seventeen (6%) Traditionals. That 3:1 ratio directly aligns with NEO vs Traditional consumer spending. NEOs are 87% more likely than the average Australian to be in the top decile of net wealth, and 126% more likely than Traditionals to be in that top decile. The new wealthy (NEOs) are very active with their money, while Traditionals are typically passive. NEOs are unafraid of debt to satisfy their desires. This is evidenced by the fact that NEOs account for almost half of all debt in the economy – $510 billion out of $1.2 trillion. NEOs are 134% more likely than Traditionals to have an investment loan. And NEOs are three times more likely than Traditionals to have charge cards. The NEO Economy is valued at $512 billion in Australia – that’s $112,000 in spending per NEO per year. The Traditional Economy is valued at $364 billion – or $36,000 per Traditional. 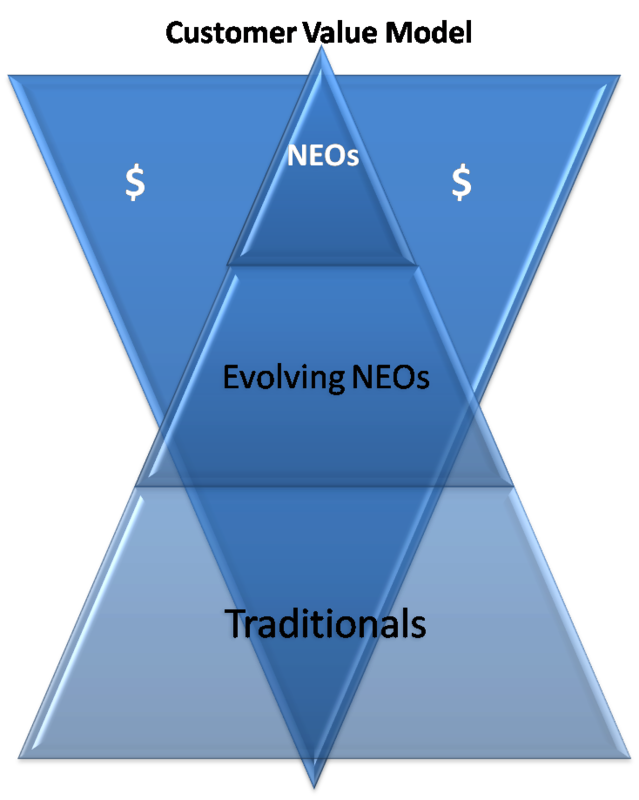 Therefore, NEOs are 300% more valuable than Traditionals when it comes to consumer spending. NEOs treat the commodities of life as mandatory and focus their real spending and investing on what is known as elective consumption. So, for example, they’re spending less on traditional products and spending more on creating emotional experiences by buying brands and experiences that are authentic and offer provenance. They’re paying for yoga classes and private trainers; they’re drinking fewer glasses of wine but buying better quality; they’re vacationing in places that enrich their spirit; they’re buying more experiences, more frequently; they’re outsourcing personal services like driving (Uber) and cooking; and they’re paying a premium for premium advice when it counts. NEOs are inconspicuous consumers. Because they define themselves by who they are and what they stand for, they don’t need to surround themselves with overt luxury or symbols of belonging. They do however want beauty, design, quality, rich information, authenticity, flexibility, provenance and choice. Guests to Clayoquot Wilderness Resort on Vancouver Island are, for example, responding to the wave started by Clayoquot’s John Caton, paying $US2,000 a night per person to stay in a tent. And Clayoquot’s NEO-powered bookings at the height of the global meltdown were 20 per cent up on the previous year. In Denver, Colorado during ‘Meltdown Christmas’ of the Great Recession (GFC), stores in the major shopping mall were all but empty … except that is for the Apple store where the line was so long a patient NEO shopper was expected to wait 35 minutes to be served. And to pay full price. NEOs are shopping and booking holidays, but only for products and experiences that make beauty linger. Outgoing, gregarious NEOs are great planners, are mobile, and are prepared to take calculated risks. For instance, at any one time 20 per cent of NEOs are actively contemplating a move from their current jobs — compared with 12 per cent of Traditionals, who typically define themselves by their job. NEOs are also more likely to take the calculated risk to start and run a small business. This is partly due to their high internal locus of control (success in life being a matter of planning rather than luck) and partly because they are more optimistic about the future than anyone else in the country. NEOs are ‘always-on.’ They love the Internet and live much of their life online; this is the place where they can exert individual control, and move towards zero friction. The 98 per cent of NEOs who are connected to the Internet go online to practice zero friction by doing their banking, stock trading, travel bookings, music and movie downloads, and anything else that saves time and helps them jettison mundane tasks. Not only do NEOs dominate elective spending; they also dominate all heavy media consumption: newspaper & magazine readership, commercial & cable television viewing, commercial radio listening, internet usage, addressed mail readership and outdoor media. This creates a new consumer currency for marketers and publishers alike. Numerically NEOs dominate even the top socio-economic category in the economy (i.e. the highest earners +the highest educated + the highest level occupations). When it comes to politics, the stark political picture is that NEOs are more likely to give their vote to the party that provides the highest level of economic certainty. NEOs are therefore more likely to vote for the Coalition because of their economic and business credentials. But life in the NEO neighborhood is never black and white. NEOs are, you see, ‘the new constituency’ in that they have well-evolved social and environmental beliefs, and they don’t believe conservatives can deliver on those policies as well as social progressives. Additionally, their openness to ‘new things’ provides an opportunity for all political parties to adopt a reformist agenda. NEOs are deeply influenced by social issues — almost half have progressive social attitudes, while less than one in five has traditional social attitudes. Half of all NEOs are attracted to ‘new things’, ahead of a third of the population and only a quarter of Traditionals. Combined, these factors provide an opportunity for social democrats to attract NEOs. To do so in sufficient numbers, however, they will need to continue establishing sound economic and business credentials to complement their social policies. Conversely, the conservatives could enhance their attraction to NEOs by boosting their social innovation. Typically, NEOs are outgoing and feel good about themselves, their leisure activities, and their jobs. They like what they do professionally: the majority say they are satisfied by their job, in contrast to only one in three Traditionals who feels the same way. NEOs like to look stylish, and are often extroverted. They might think of themselves as ‘a bit of an intellectual’, they believe that success is important, and consider it important to have responsibility in their jobs. NEOs’ high locus of control ensures they are passionate about the Internet, computers, and technology — not just because they are early adopters, but also because new technology gives them more control over their lives. NEOs are likely to ‘take calculated risks’ and to challenge themselves intellectually and physically. They are more likely than Traditionals to fly a plane; and, of all the people who compete in triathlons or marathons, NEOs are four times more likely than Traditionals to participate. Triathlon or marathon competitors are, of course, small in absolute numbers (they comprise only 1 per cent of society). Walking, jogging, and gym work are the most popular exercise activities in absolute terms, with more than half of all NEOs participating, compared to 40 per cent of Traditionals. NEOs are a massive four times more likely than Traditionals to participate in snow skiing, 3.3 times more likely to go sailing, three times more likely to scuba dive, 2.4 times more likely to water ski, and twice as likely to go board surfing and body surfing. The self-reflection and inner-directedness of yoga is particularly attractive to NEOs — they are twice as likely as Traditionals to participate in yoga. Traditionals are dominant in other sports and leisure activities. For example, they are almost twice as likely to participate in salt water fishing, and one-and-a-half times more likely to hunt and shoot game. Entertaining at home is very popular with NEOs. They are driving the Netflix phenomenon. While a quarter of the population entertain over a meal, one in three NEOs like to cook and entertain at home — in stark contrast to just one in six Traditionals. NEOs do not, however, view cooking as a chore. If it were they would outsource it. Rather, they see it as a gift to those they love and necessary therapy for themselves.When it comes to drinking wine, more than half of all NEOs like to drink wine at home, compared to less than a third of Traditionals. But NEOs are moving constantly towards better quality wines. When they do go out, NEOs like to go to the cinema and to live performances. They are more likely than anyone else to go to the movies, attend live theatre performances, go to the opera or ballet, or attend a music concert. NEOs are even more likely to go to a rock or pop concert; and, while jazz, classical, and blues performances are less popular with them than rock or pop concerts, NEOs lead in opera and ballet attendance. Two-thirds of NEOs over the age of fourteen go to movies in any three-month period, compared to less than half of Traditionals. NEOs are passionate, active, involved individuals. Australian marketers & entrepreneurs need to see them as 4.6 million markets of one. In seeking the path less traveled, NEOs still encounter mainstream culture (such as football), but it is their individual twist on the mainstream that distinguishes them, and makes them a challenging audience for mainstream marketing approaches.